April is finally here…which means that I get to tell you about our newest book, Silhouettes. For this book we decided to focus on easy-to-wear garments with unusual construction and details. 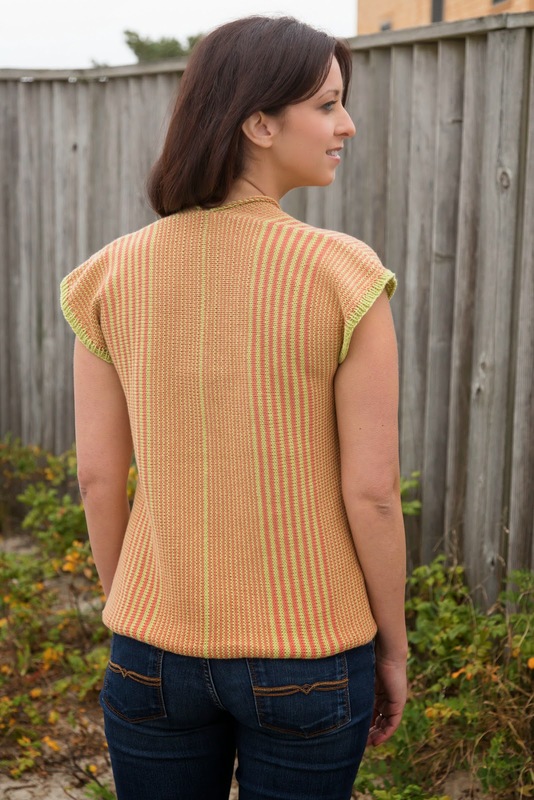 The perfect example of this is the Salina top designed by Tonia Barry. At first glance it looks like a simple v-neck top. But if you look closer you will see that it is knit from side-to-side. Using two colors of Cerro, it’s knit from the center out, starting with a provisional cast on. The stripes change in thickness giving it the illusion of waist shaping, even though there isn't any. Which makes it…wait for it…even easier! Derby designed by Susan Mills is waterfall cardigan that is knit is 3 pieces…2 really small ones and one REALLY big one. Simple lace keeps this piece from being too boring, yet can be a Zen-like experience (go ahead and rent that movie with subtitles, each row of the lace stacks nicely on top of the previous one). Knit in Sanibel this cardigan can be a staple for any woman’s wardrobe. You know…that piece that you will grab as you are running out the door, no matter what you are wearing (jeans and a t-shirt or a spring dress). One of the more popular pieces from this book is the Wellington, knit in Bella Lino designed by Tian Foley. From the front this tank is a simple silhouette with just a touch of lace at the neckline. But turn it around and you will see the split back and the button and tie details. If an open back isn't your style, Silhouettes lets you know how to make Wellington with more traditional closed back too. There are lots of other good pieces in the book. Make sure to check them all out!